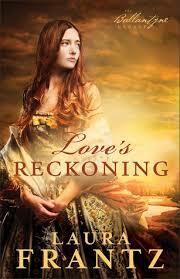 I really enjoyed Laura’s story of Silas Ballantyne, in her latest novel, Love’s Reckoning . Silas is a Scotsman who arrives in York County, Pennsylvania to finish his apprenticeship as a blacksmith. he unwittingly is being courted by the eldest daughter with the idea that he would marry into the family and take over the business as the master, Liege Lee is aging and struggling with gout. Secrets haunt the Lee family but in spite of all that Silas is captivated not by the eldest daughter, Elspeth, who has targeted him for her own, but by the youngest daughter, Eden who slaves away uncomplainingly with grace and beauty and a heart to know more about God and the Bible. Silas has no idea of this hidden expectation and rebels against it when he finds out. While he has fallen in love with Eden he has no plan or desire to stay in this household of seething resentments and hostility. His plans are to head West to a new life in the wilds that eventually become Pittsburg. Events conspire to draw them together and then rip them apart. I loved the story and the complexities of the characters and relationships that were so skillfully drawn out. The ending seemed to wrap up too quickly for me, but at least it was a gratifying end after all the pain and heartache Silas and Eden had to endure.